Hand made from a recipe handed down from generations, each batch of chocolate created from the freshest ingredients, and shipped immediately. 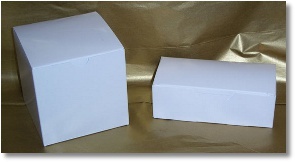 Boxes: You have a choice between a 4x4x4 box that holds 1 lb of delicious chocolate, or a smaller box that will hold 1/2 lb. Each will be wrapped in festive paper per the buyer's instructions, or can be left 'bare' for the buyer to add their own personal touch to. 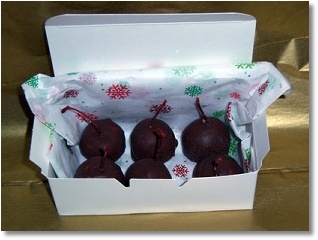 These cherries have been soaked in Kahlua for a specific length of time, then drained and hand wrapped with a special candy dough and hand-dipped in melted chocolate. 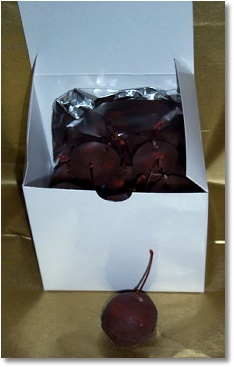 The end result is a delicious flavor for your not-so-typical chocolate covered cherries. Order by the pound or half-pound. (Note: You get more than 6 in a half-pound, it was easier to take a clear picture with just 6 in the box). Made-to-order. I keep cherries on hand soaking in Kahlua, Brandy and Cognac. 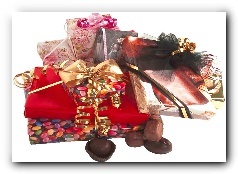 All orders placed will be made to order to ensure the freshest and most delicious chocolates ever! Note: Chocolates can only ship during cooler months, i.e., November through March. 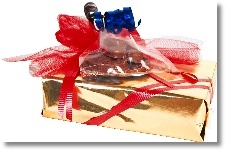 Arrangements can be made to ship on alternate months with the addition of freezer packs to keep the chocolates cool during shipping.